This traditional Slavic favorite gets a makeover with fresh spices, vodka, and a cooking method that preserves the crunch. To my surprise, my chef friend became very animated. It turns out that the guy she’s dating is a die-hard “meal in a bowl” devotee – despite the fact that she produces a cheese soufflé with the same ease with which I open a can of soup. If you ask me (and no one ever, ever does) women like us are wasted on men like them, but what can you do? Make some stuffed peppers, I suppose. When I was a tour guide in the mid-1990s, I ate a lot of stuffed peppers, which made regularly scheduled appearances from Trieste to Warsaw, from Kaliningrad to Khabarovsk. They were awful! Here’s the thing about peppers: Green peppers are just not ripe, which is what makes them so disgusting. Would you eat an unripe pear? No. But 90 percent of the time, the stuffed peppers were green. And I don’t even want to remember the stuff that was in them. My money, however, is on the Tatars, those marauding barbarians who introduced all kinds of dangerous things to Russia like spices and taxes during their 300-year occupation of the Slavic lands. Stuffed peppers may appear daunting, but after I dove into Cooks Illustrated (which is also never wrong) for some technique tips, they turned out to be a snap. You can make the filling ahead of time, and if you use a muffin tin to anchor the peppers, you won’t face the disappointment of having propped them up a baking dish only to end up with peppers that sag like bad luggage after a long haul flight. This dish offers a wonderfully creative opportunity to play with flavors since bell peppers are a culinary blank canvas. For best results, combine a meat or fish with a starch, aromatics, a lead herb, a dried fruit and a fresh vegetable. The sauce should be an easy marriage between a dairy and a hint of tomato. I like to spice it up, but it would be fine plain. The recipe below combines lamb, feta cheese, dried figs, ginger, and rice in a lemon vodka-spiked tomato and Greek yogurt sauce, but HRH said that the batch made from pork, breadcrumbs, dried apple, currents, and sage was just as good. When it comes to a “meal in a bowl” HRH is pretty easy to please. 1. Combine the uncooked rice with 1 cup of water and 1 tsp of salt in a small saucepan and simmer until cooked. Set aside. 2. Preheat the oven to 350°F (180°C) and place the rack in the middle of the oven. 3. Prepare the peppers by slicing the tops off (a good measurement is one thumb width from the top). Use a small sharp knife to carefully remove the core of the pepper. 4. Bring a large saucepan of water to a rolling boil and plunge the peppers in for 2 minutes. While the peppers are cooking, fill a large bowl with water and ice. Remove the peppers carefully from the boiling water with a pair of tongs and immerse them in the ice water. This is a departure from the traditional roasting method used in Eastern Europe, which helps to retain the peppers’ shape and a little of their crunch; and this makes a nice contrast to the soft filling. 5. Heat the oil in a large saucepan, then add the garlic and onions. Cook until softened and translucent. 6. Add the ground lamb, and use the back of a spoon to break up the meat. Cook over medium heat until completely brown (5-6 minutes). 7. Add the tomatoes, ginger, oregano, sumac, cayenne pepper, and dried figs. Continue to cook for three more minutes. Adjust seasoning with salt and fresh black pepper to taste. 8. Remove the saucepan from the heat and transfer the mixture into a large mixing bowl. Add the rice, the pomegranate syrup, the mint, the scallions, and the yogurt and toss lightly to combine. 9. Toast the pistachio nuts over high heat in a frying pan for four minutes, then grind in a mortar and pestle or a food processor. 10. Remove the peppers from the ice water and dry them gently with a paper towel. Insert each bottom part of the pepper into a muffin tin hole, then carefully spoon the lamb mixture into the pepper. If you don’t have a muffin tin, use a wide-lipped lasagna or brownie pan and prop the peppers up before you fill them. 11. 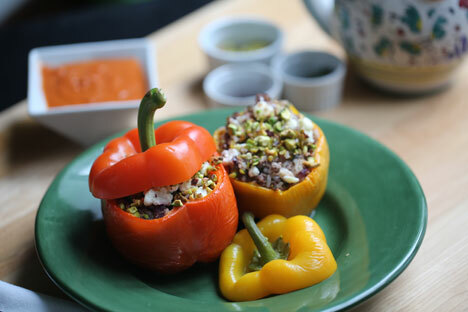 Top each pepper with crumbled feta and ground pistachio nuts. 12. Bake for 25-30 minutes. 14. Melt the butter in a large saucepan and cook the onion until soft. Add the tomato and cook for 3-4 minutes until the tomatoes begin to break up. 15. Add the yogurt or sour cream, reduce heat and stir gently as the mixture thickens. 16. Add the lime zest, vodka, and Tabasco with salt and pepper to taste. 17. Use a handheld mixer or blender to puree the sauce, then return it to the heat for 1-2 minutes. Adjust seasoning to taste. 18. Serve immediately – one to two peppers per person with plenty of sauce – in a bowl, of course. Jennifer Eremeeva is an American free-lance writer longtime resident of Moscow. She is the author of the humor blog, Russia Lite and creator and curator of the culinary website The Moscovore. Her forthcoming book, Lenin’s Bathtub, is scheduled for publication in November.